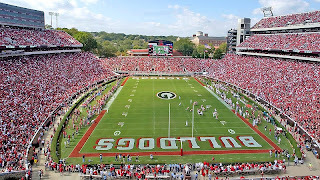 I was looking around at the secondary market prices for some of the away games for the Georgia Bulldogs. The prices seem to have dropped a bit over the past few days. I think that's mostly because people are starting to get their season tickets in hand, and they are putting their "extras" online for resale. The biggest drop so far has been the price for Georgia Bulldogs vs. South Carolina Gamecocks tickets. Ticket prices start at $89.00 each as of the time of this posting. The visiting section at Williams-Brice Stadium usually includes the bulk of the 900 level in the end zone. I think our lower level area is usually around Section 17. I believe that the upper deck visitor seats along the sideline are primarily in Sections 501 and 509; however, they seem to give us some seats along the back of almost every section in the 500 level. All ticket prices are via Stubhub.com. The visiting section at Williams-Brice Stadium usually includes the bulk of the 900 level in the end zone.